The 5,800 square foot Visitors Center has a history of its own. 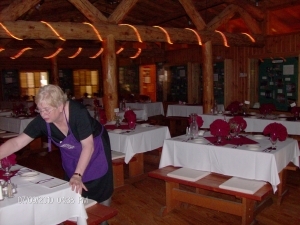 It was originally a fine resort called Snowbank Lodge located on Snowbank Lake, 22 miles east of Ely, Minnesota. When the federal government created the Boundary Waters Wilderness, this building had to be removed. The Wisconsin DNR purchased the building and donated it to the Burnett County Historical Society for use at Forts Folle Avoine. Volunteers dismantled the entire building, including a large stone fireplace, and reassembled it at its current location. Fur Trade: Flint and steel strikers, fire starting kits, clay pipes, trade silver, tobacco boxes, powder horns, tea, sashes and garters, clothing, leather pouches, ostrich plumes, books. Northwoods theme: Note cards, stuffed animals, key chains, pottery, photographs, books. Books: Fur Trade, Native American, Wisconsin, Logging, Lake Superior, Local History, Animals, Wildflowers, Trees, Butterflies, Dragonflies, Mosquitoes, Mushrooms, and more. 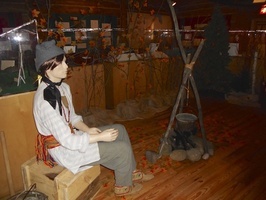 There are multiple exhibits throughout the Visitor Center, both Native American and Fur Trade, that represent the life and times of the 1802 -1805 period. 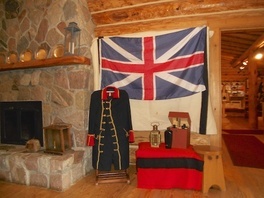 The museum contains a variety of archaeological artifacts uncovered during the excavation of the original fur trade site. On display are items from both the ﻿North West and XY Companies that offer visitors a vivid portrayal of fur-trade life along the Yellow River, over two hundred years ago.